$50.00 21 cm mortar ammunition holder. $165.00 Large Wooden Munitions Box its handles removed has hinges and a lockable hasp for securing the contents. Unusual stenciling in German on the front and the back as well as under the lid raises the strong possibility that this box dates to the First World War. 27 ½" x 9 ½" x 15 ½". $110.00 Wooden munitions crate probably for rifle ammunition. Various unclear stencils, a 1944 date. 6 3/8" x 5 ½" x 30 1/4". $125.00 Tin-lined wood carton was partially painted white at one end and lightly white-washed all over in an attempt at Eastern Front winter-time camouflage. 10" x 26 ½" x 8 ¼". 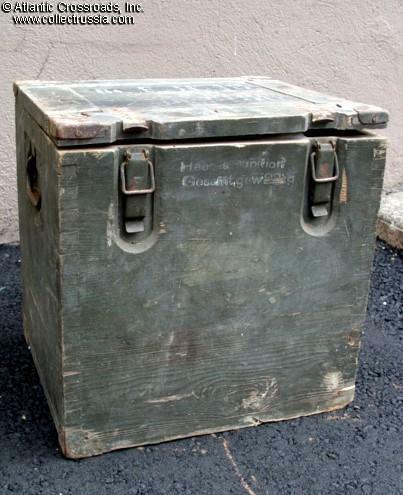 $145.00 Large Wooden Box for 8cm Anti-Tank Ammunition. 33 1/2" X 14 1/4" X 6". $75.00 Wooden munitions crate probably for rifle ammunition, circa 1943. 6 3/8" x 5 ½" x 20". $120.00 Wood ammo box with hinged lid. 18" x 14" x 7". With stenciled lettering and a large paper label. $70.00 Wooden munitions crate, probably for 7,5 cm PaK 40 anti-tank shells, 14 3/4" x 15 5/8" x 4 7/8". $55.00 "Bakelite" fuse container for Howitzer M-18. 6 1/4" diameter, 6 3/4" tall. $125.00 Wehrmacht 21cm Mortar special ammunition holder, circa 1942-1943. Over-sized cylindrical wooden container with hinged steel lid and base. 23 1/4" x 9 1/2".